On Sunday, April 30th 2017 at 5:00 PM, the ABCNJ Annual Asian American Worship Service was held at First Baptist Peddie Memorial Church in Newark. We are happy to announce the 2016 Asian Conference and Convocation, June 21-24, 2016, hosted by ABCNJ at First Baptist Church of Haddonfield. The Alliance of Asian American Baptist Churches and Asian Ministries ABHMS would like to invite all ABCNJ churches, families and friends to the opening service, on Tuesday, June 21, 2016, at 7:00 PM at First Baptist Church of Haddonfield - (124 Kings Highway East, Haddonfield, NJ 08033) We will be presenting a diverse, multicultural worship service to celebrate the theme of the conference which is geared to the next generation and titled "Let young eagles fly". A special thanks goes out to Rev. Dr. Michael Feicht, as well as the congregation of First Baptist Church of Haddonfield, for allowing us to use their facilities. We also want to give special thanks to Rev. Dr. Lee Spitzer, ABCNJ Executive Minister/Senior Regional Pastor, all of the ABCNJ Regional team and GDVA association for their support and Partnership in Christ. 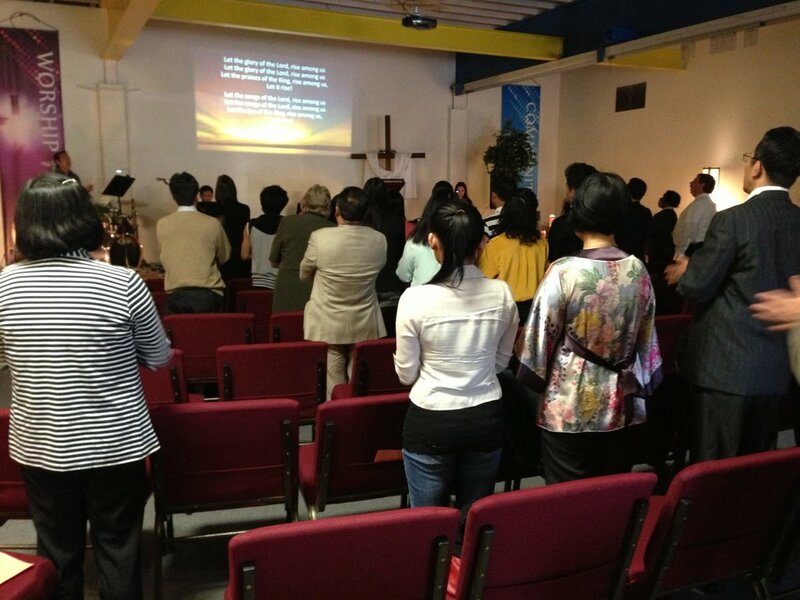 On April 19, 2015, at NextGen Church in West Windsor NJ, ABCNJ Asian Churches met for worship and fellowship. This gathering was unique and inspirational due to the fact that we expanded the invitation to entire church families and asking for youth and children participation. We have never had this many people in attendance. The service lasted longer than usual but was enjoyed by all due to the mulitcultural hands on involvement. There were about 75 people in attendance, including pastors, lay leaders, and many members of the church family. We had worship, praise, mission sharing, testiomony, and special music from several churches' youth and children. Our guest speaker, Rev. Dr. Lee Spitzer, ABCNJ Executive Minister and Senor Regional Pastor, spoke on the revival of our own communities. The need to witness the power and life of Jesus Christ being the main focus, right here. We actually practiced what was preached by participation and involvement of our church communities. We want to offer a special thank you to NextGen church, congregation, and their pastor Rev. Dr. Mia Chang, for hosting this event and preparing a wonderful meal for all in attendance. What a Joy of Cleaning day! On Friday, April 26th, 11 children and youth from First Asian Baptist Church of Haddonfield volunteered to clean the outside areas surrounding The First Baptist Church of Merchantville. They worked diligently and joyfully competing with each other to fill trash bags with leaves and debris from the surrounding area and parking lot of this building, which is currently under the care of the region. They worked for about 4 hours and filled 25 bags which will be collected by the township next week. They learned the meaning of volunteering and working together to help our region as partners in Christ. We had a wonderful Asian Pastors and lay leaders retreat at NextGen church in West Windsor, NJ, Sunday, April 21, 2013. Our theme was "Here I am, Send me." Isaiah 6:8. Pastor Mia Chang, Senior Pastor of NextGen Church and her congregation hosted the gathering and prepared a wonderful program and meal following the service. We had a very diverse ethnic group about 60 in attendance. There was much sharing via PowerPoint, highlighting each church's ministries. Rev. Liz Congdon, Senior pastor of FBC of Trenton shared her ministry with Burmese congregation. There was, also regional staff members, Rev. Dr. Luciano Marquez, Latino Ministries, and Rev. Dr. Peter Ely, ABCNJ Academy, in attendance celebrating and sharing. We also had a special event celebration, for our ABCNJ Executive minister and Senior Regional Pastor Rev. Dr. Lee Spitzer for his 10 years of service to our ABCNJ and Asian ministries. He was the keynote speaker, enlightening us about our response to God's call- "Here I am, send me." We thank to the Lord for our Asian Pastors and lay leaders worship and celebration. Please continue pray for our Asian ministries and their response to God's calling. Blessing service for Pastor Lim! I went to a special service on Friday, December 21st, at 9 PM in Teaneck NJ for Rev. Dong Soo Lim, Mission Pastor of Evergreen Baptist Church, where Joshua Pyon is senior pastor. The congregation had a special service for Pastor Lim. Pastor Pyon led the service and Pastor Lim shared about his new church planting. His sermon was about the filling of the Holy Spirit, God will support us. After the sermon, I was the representative of the ABCNJ Associate Regional Pastor for Asian ministries giving a word of encouragement to Pastor Lim and the congregation, and a thank you to Pastor Pyon and the congregation since they have been working well together with Pastor Lim for the pastor five years. I gave Pastor Lim and the congregation some guidance as to what was needed to join our region and new church planting. After the service we had fellowship and blessings for his new journey. Now Pastor Pyon and Evergreen Baptist church want to support Pastor Lim and his new church. They proposed to mission support Pastor Lim for 10 months at $800.00 a month, through the ABCNJ region. Pastor Lim already has a place to rent and plan to begin the first week of January. The Church name is "Overflowing Joy Church" in Paramus. What a blessing it is that he has such a wonderful relationship with his old church and partnership with our region. May God bless Pastor Lim and his family's new beginnings to the glory of God. 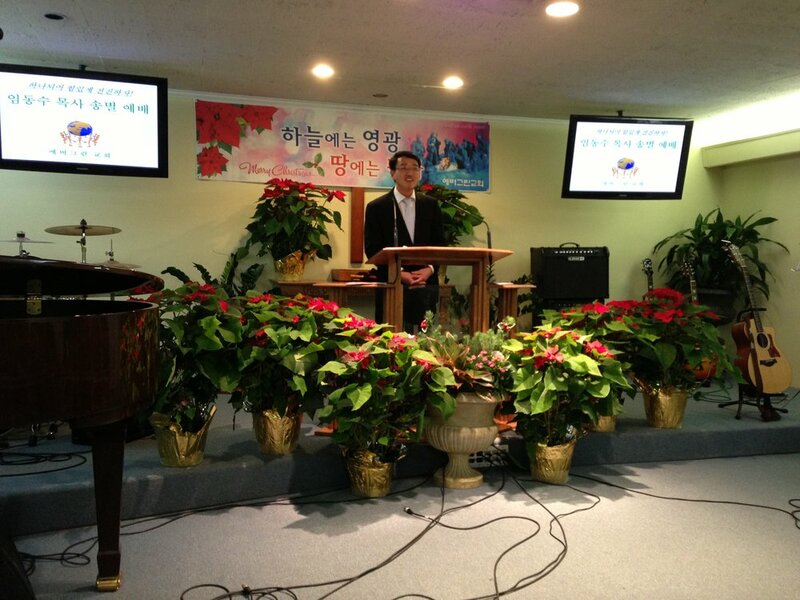 We had a wonderful Korean Pastors family fellowship on Sunday, December 23rd at 7 PM in Kumhojeong restaurant in Edison. There were 6 families in attendance. We shared, praised, and prayed together. I shared with them our region ministries and events, 2012-2013. This year we have 2 NCP's Korean pastors and hopefully next year we will have more. We praise God for his blessing on the growth of our Asian ministry in our region. I would like to invite you to the 2012 Asian Pastors and lay leaders retreat which will be hosted by Evergreen Baptist Church in Teaneck NJ. Rev Joshua Pyon, who is the senior pastor, and the congregation will be preparing delicious Asian refreshments upon our arrival and a great Korean style luncheon for us. The retreat will be Monday, September 10, 2012 -10AM-3PM. Our retreat theme is “Who are your friends”, John 15:13-15. The major focus of this retreat will be to hear your suggestions regarding Asian Churches cooperation and working together in Partnership with the region. Our Keynote speaker is Rev. Dr. Lee B. Spitzer, Executive Minister and Senior Pastor of ABCNJ. Also, Karen Jackson-Weaver, Ph.D (ABCNJ Associate Regional Pastor for New Church Development), Rev. Dr. Elmo Familiaran (ABCNJ Associate Regional Pastor), and Rev. Florence Li (American Baptist Home Mission Society) will share their ministry with us. Thank God that we are able to have this retreat to worship together with prayer, fellowship, and sharing with each other in partnership with Christ. Attached is a copy of the agenda. Please come celebrate our work together. If you have any questions, please contact me by clicking here. 1:00 - 2:00 – Leadership stories. 2:00- 3:00 PM – Discussion: Working together for a better ministry.